Owing a guitar is a common wish of any beginner who wishes to master this splendid skill. Guitars for starters are available in various brand names and price ranges. 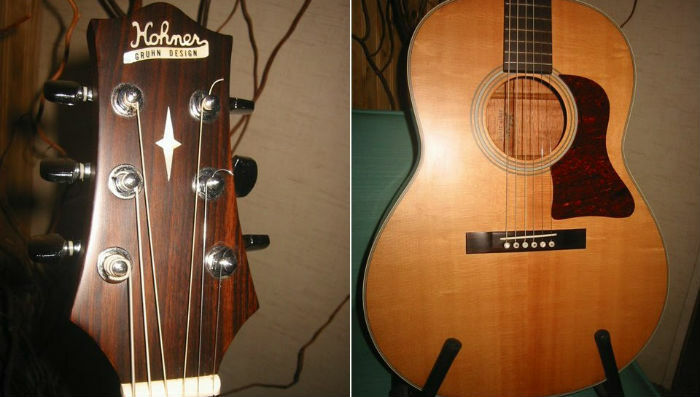 Rouge and Hohner have credited themselves in distributing bargain priced acoustic guitars to the market. With years of testifying this type of instrument, we confidently bring a Rouge vs. Hohner starter guitars review to clarify the good and the bad. In addition to giving you a clear view of these products, we will further distinguish the benefits of each brand to help you make the wisest decision. Let’s go. We won’t keep you waited any longer. To have an insightful understanding about one product, nothing is better than looking back to its history and achievements. While Rouge and Hohner have different foundations, they both dated back more than a decade. Therefore, it is needless to be skeptical about their reputation in the field. Rogue is house to a series of low-cost guitar line introduced in the mid-1990s. It has the origin from a music distribution company named Musician’s Friend. The business located near the Rogue River in the Rogue Valley of Medford, Oregon. It is the river’s name inspired the birth of the guitar line. The Rogue has expanded to other stringed instruments including mandolins and basses. It also features in producing amplifiers and keyboards. 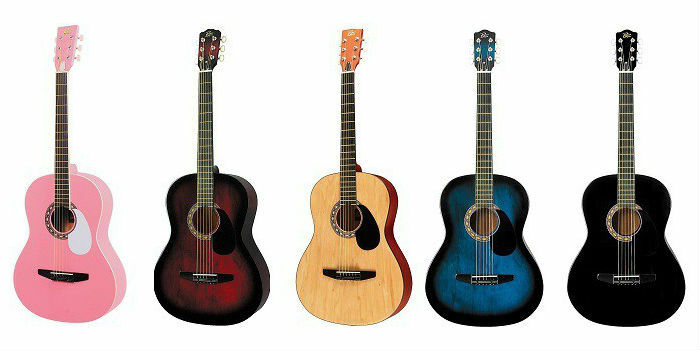 Since 2010, Rogue guitars further launched their project of electric and acoustic guitars in wide price ranges. Their guitars come from a manufacturer called Sunbo Industrial based in South Korea. Musician’s Friend takes care of distributing as the primary supplier. Rogue guitar line is famous for its reasonable prices ideal for most beginners. Despite the low-end cost of acoustic, bass, and electric guitars, the company rarely fails their products’ quality. Though the budget guitars are not from premium class wood, they provide acceptable quality for the money. Hohner Musikinstrumente GmbH & Co. KG is a long-standing instrument manufacturer founded in 1857 by Matthias Hohner located in Germany. The company specializes in producing harmonicas and accordions. They have earned a grand reputation in manufacturing a wide range of innovative musical instruments. Their quality has scored a spectacular rank by professionals. Hohner has identified themselves in the guitar industry since the 1970s. Ever since, Hohner has been making moderately priced guitars favoring guitar beginners in quality and solid construction. It is the development of the Blues influences their instruments. Their guitars serve from the less quality to top class standards. Though the budget guitars come in inexpensive material, the adapted technology gives way to generate tolerable quality. Rogue vs. Hohner. Who is the Winner? There is no doubt that these music companies are authentic in their expertise. But competition is what brings these brands in the battle. When it comes to comparing the price and quality, it is arduous to tell which one could be the winner. We will look at the most popular models of each label to elucidate the advantages and disadvantages. It could be unconvincing that you can find a nice guitar under $50 that wouldn’t wear down in one week of performing. The cheap acoustic guitars’ world is of minuscule where you can find a truckload of defective devices promoted to work like a charm. Thankfully, Rogue RA-090 is a good guy. 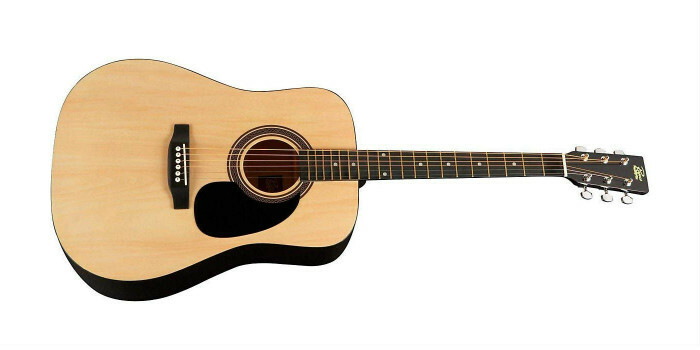 In spite of the economical price tag, the starter acoustic guitar is reliable for its playability and quality. This dreadnought acoustic looks more superior than it costs. For your information, a dreadnought guitar is an exceptional larger guitar provides more vibrant tones. The money reflects in the material made the body and neck. We guess you can’t expect something better than laminated whitewood in the body. However, the glossy finish comes in a selection of colors is a plus to its appearance. The C-shape neck is from solid nato includes 20 frets which are sustainable to powerful tone. It has the length of 25 3/8 inches with a noticeable join at the fourteenth fret. It’s a fair assemble and durable enough guitar in this category. This durability allows a valid external string change and tuning. We anticipated this Rogue doesn’t come with any electronics. The nickel hardware and turners have sufficed the mean of twisting the pitch of the guitar’s tone. Paint maple bridge and extended fretboard allow clarity in each note. There is a black pickguard to avoid scratching while it is sometimes not available in higher-range guitar. The headstock accommodates six lines of metal strings and covered turners. Pain when playing with steel strings is inevitable. We recommend you to read more about how basic guitar hurts fingers (link) with plenty of tips to avoid this ache in the first place. We have tested through a few chords and melody and felt comfortable with the music it offers. For jamming, the sound goes clear and quite balanced in tone. You will find each note is on the bright side combine with the efficient volume fits perfectly for beginning practice exercises. As a wallet-friendly guitar, we bet it bears tons of negative comment, but we don’t judge the quality over the price here, though the item has done above its value. The only disadvantage we care is it doesn’t come with a case. As a beginner, you’re probably not ready to bring it around for an impromptu performance; then you don’t need a case. With a generic house brand background, Rogue doesn’t look forward to producing miserable models. As a whole, the RA-090 presents what Rogue guitar line longs to offer their customers. This guitar will be the presenter of Rogue on the category of guitars for kids. The first thing to say is about the size. This Rogue guitar is of 7/8 scale makes it a playable instrument for kids. It has a rosewood fretboard, the maple neck all pairing with Martin string for the best tone possible. It comes with six elementary string tuning machine finished in fair quality. It can be a bit stiff at the first use but will loosen by time. For a small guitar, the sound comes out in higher pitch compared to a full sized one. This is normal in exchange for the portable feature it offers. This guitar doesn’t have to be for kids as a whole. People with small body frames can find it fun and convenient. If the Rogue budget guitar comes with steel strings that terrify newbies of hurting their fingers, this full-size nylon stringed guitar from Hohner will bring down the fear. The HC06 is a classical take for beginners, especially small handed people who just stepped into the fretting and strumming world. Starting with a classical guitar is not a bad idea. You will experience the sweet classic vibes through its nylon strings. The manufacturer claims this product to be the “Hohner A+,” which means it has passed the standard for a complete instrument to be released to the market. Thanks to the use of spruce top with catalpa sides in the whole body, the guitar looks sturdy and firm once held in hand. The front is made of laminated wood to reduce the cost and coat with walnut paint. HC06 has the mahogany neck with fretboard made of rosewood. I’m glad to catch this favorite wood type used in more expensive guitars in this budget one. The neck hosts 18.5 frets conjoined with the body at the twelfth fret. All in all, the company has tried its best to bring the most comfortable shape to this guitar. Hohner has done a brilliant job in bringing the most advantage possible to the string stability and intonation. The benefit lies in the rosewood bridge system, and the 3-in-1 type chrome plated tuning machines on the headstock. This feature ensures the most effective experience on the instrument at the lowest cost you can imagine. 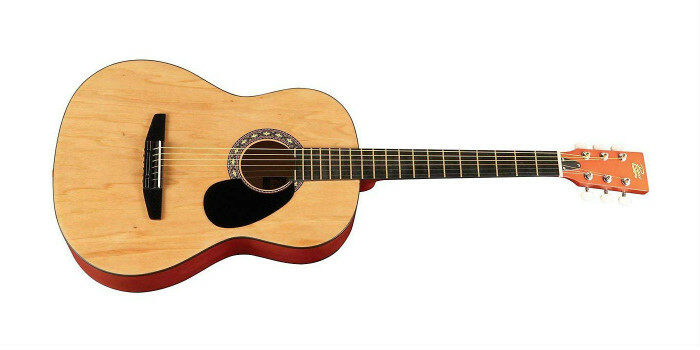 It is this sumptuous function mark HC06 to be one of the top choices of the best acoustic guitar for beginners. 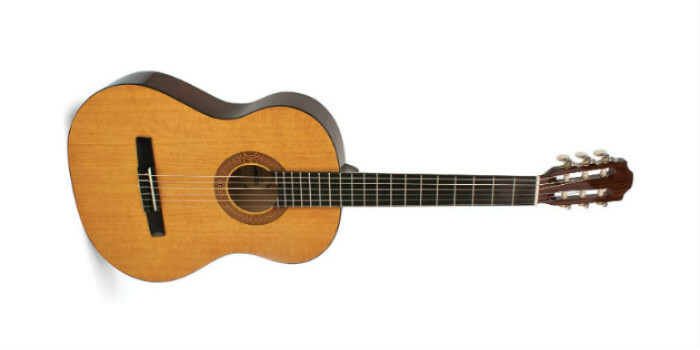 As a full-size classical guitar, HC06 has a wide neck which is not suitable for toddlers. On the other hand, it is a model for students in the HC series. I’m not entirely in favor of the sound from this guitar, but it’s total fine when you acknowledge its price tag. However, it owns a dynamic range and an even balance in tone though the depth of sound is uninspired. Do you know what’s kicking us about this guitar? Aside from the front body made of plywood, we genuinely appreciate the effort given in the way Hohner added to HC06. It didn’t cause us any trouble sliding along the fretboard yet distribute an unexpected cozy holding at the wrist. We had no issue with the nylon strings reacting to the pressing once, but it did irritate us as it soaked along with our hand sweat. The moisture induced the strings to slide off the tips of the fingers. Otherwise, we have nothing to complain about HC06. It’s a great guitar for beginners. In competing with the Rogue guitar for children. We think this Hohner HAG250P will make the match even. This guitar has a non-cutaway body crafted from laminated agathist. The material is strong enough for a small guitar that will lay neat in your embrace. The neck is made of mahogany, and the fretboard is from generic hardwood. The whole unit is connected at the twelfth fret. The guitar offers full eighteen frets which are beyond a beginner’s need. The bridges are of basic hardwood which is predictable for a guitar under $50. What is mentioning is the set of six open-gear tuners with plastic buttons provide stability in tuning. You can expect a little more than basic sound from this Hag250P which is audible and quite clear. The guitar gives beginners what they need. For children, it comes with an appeal price tag to parents which will make it a fascinating gift. Why Shouldn’t You Buy an Expensive Guitar at First? You are the newcomer to the guitar class. Whether you are positive about your spirit for mastering the guitar in the long run, or short-term, cheap acoustic guitars should always be the optimal option. Affordable guitars are there for many reasons, but there is one explanation for its success on the market. It is the need for new students like you. You would not be able to sense the sound any different from a high-class guitar with the amateur ears. Furthermore, you don’t need a guitar with all the features you don’t need since you haven’t grown any skill yet. Better wood and a supportive bridge system are for advanced players who know what they can take advantage of. A budget guitar focuses you on sharpening your skills and growing your confidence with the hands on the strings. In the worst scenario where you decide that you don’t love guitar anymore, you can give up the cheap one without feeling much guilty to your wallet. When your ability is at the higher level, it is time to consider a better upgrade. At the end of the day, you have to end up with one guitar. So, which one could go in your mind? 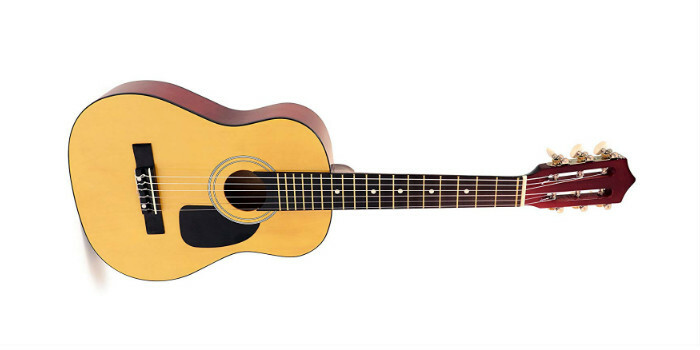 Rogue or Hohner Acoustic Guitars? We love to challenge on the steel strings. In particular, we want to suffer the finger pain every passionate guitarist went through. While not hurting the wallet, we can have slight access to the music world with all the basics needed. Needless to say, Rogue guitar line has proven its quality and earned itself a popularity of guitar players from amateurs to professionals. Products from Germany are reliable with a rigorous manufacture process. Also, Hohner guitars offer well-built body and qualified source of wood to ensure their products in the best condition equivalent to the cost. We admire the tradition of quality that has been standing there for years. We can tell they want to keep holding the stance for many more years by not failing their clients. With Rogue and Hohner starter guitars in the under $50 category, we believe you will get more than the value you pay. You can entrust the benefits a cheap guitar from these companies delivers to beginners. We hope you have made your choice and knew where your money should go. Good luck with the shopping and don’t forget to share the knowledge.